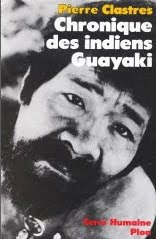 I've been reading "Chronicle of the Guayaki Indians," a 1972 account of a Paraguayan tribe by French ethnographer Pierre Clastres. It's not the contents of the book itself I want to recount, but the saga of Paul Auster's translation of the book into English, which he describes in the translator's note. At the time of the book's publication in the original French, in 1972, Auster was "desperately poor," working as a freelance translator, taking whatever gigs he could find, often with books he did not even like. But he loved "Chronicle," and proposed a translation to countless American publishers, until finally being accepted by a fledgling press around 1976. After the "thoroughly enjoyable experience" of translating the book, Auster gave his editor the one and only copy of his translation -- he was too broke to photocopy it. In 1977, months before the translation was set to be published, Clastres was killed in a car accident. But at least the book he birthed would find new life in English. Or so it seemed. But years passed as the publication was delayed, the publisher became insolvent, the rights for the translation were sold to another press which in turn lost the sole copy of it. "No one had ever heard of it," Auster writes. "For the next dozen years, that was where the matter stood. Pierre Clastres was dead, my translation had disappeared, and the entire project collapsed into a black hole of oblivion." Finally, in October 1996, after he gave a reading in San Francisco for his new book ("Hand to Mouth"), Auster was approached by a man who gave him a set of bound galleys. It was the uncorrected proofs to his translation, which this passionate collector of books had bought for $5 from a remainder bin at a used bookstore. Nearly twenty years after Auster released the translation from his grasp, it was returned to him. The author is dead, but "at least there is the small consolation in the thought that Pierre Clastres's book has survived." (Auster says in his note that the tribe has vanished as well, though an Amazon.com reviewer claims they still exist and prefer to go by the name "Aché"). The book still exists in French, of course, but I'm struck by how contingent was the delivery of this story into English; and by how many other precious stories have been lost to time or chance. PLEASE SUBSCRIBE TO THE FREE PODCAST ON iTUNES BY CLICKING HERE. THE INTRODUCTORY EPISODE IS NOW UP. YOU CAN ALSO DOWNLOAD OR LISTEN TO THE EPISODE ONLINE BY CLICKING HERE. this is the first post of "Inside Stories," a blog and podcast about storytelling in its many forms. When I say "storytelling," I'm talking about everything from fairy tales, to psychotherapy, to sermons, to gossip, to journalism, genealogy, courtroom cases, the theatre, film, literature and lots more. You'll hear stories, and conversations about how and why people tell stories. I'm especially interested in how people use storytelling to build community, and advance peace and social justice. In both the blog and podcast, I'll be aiming for insight, imagination, and fun. ABOUT ME: My name is Paul VanDeCarr, and I've long been fascinated by how and why people tell stories. Most of my studies (Russian language and literature, theology) and my work (arts writer, radio reporter, mediator, storytelling program coordinator, oral history interviewer) has related to storytelling in one form or another. 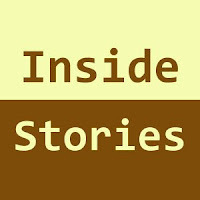 You can hear a bit about me in the first episode of the "Inside Stories" podcast, available by clicking the links at the top of this post. ABOUT THE BLOG: Here on the blog you can expect to find short interviews, digests of storytelling-related stuff I'm reading, occasional behind-the-scenes videos, links to articles I'm reading, bursts of imagination from people I talk with, and yes, stories! As the blog evolves, I'll give readers a chance to share their own stories on certain themes. And you're always more than welcome to comment on posts. I'll post at least a few times a week. Please stay up-to-date on the blog by bookmarking this page, subscribing to the RSS feed, or entering your email in the field at the upper-right-hand corner to receive notifications about new posts. ABOUT THE PODCAST: Each episode of the weekly podcast will be 10-15 minutes long, and will be released on the weekend -- I'll aim for Sundays. You'll hear conversations with storytellers and story-listeners of all sorts, as well as little storytelling excursions. Some of the first episodes include chats with playwright Maya Lilly, erotica writer Susie Bright, transmedia producer Jeff Gomez, and Holocaust museum curator Steve Luckert. I'm also working on episodes about a dinner cruise for soap opera fans, another one about fortune-telling, and more. As I get more in the swing of things, I'll invite podcast listeners to submit their own stories on any number of themes. TO LISTEN TO THE PODCAST: Please subscribe to the free podcast on iTunes by clicking here. That'll open up iTunes, and you can click "subscribe" there. You can also download or listen to podcast files online; each podcast episode will have a corresponding blog post, and there will be a link you can click to listen online or to download the mp3 file. For the introductory podcast episode, click here to listen online. PLEASE LET ME KNOW WHAT YOU THINK: Stay in touch! Comment on the blog posts, or write to me at InsideStoriesOnline (at) gmail (dot) com. Tell me what interests you or what bores you about the blog and podcast. Let me know if there are people, organizations or stories you think I might like to write about. P.S. Below, you'll find a few free audio walking tours of San Francisco that I produced. You can get them on iTunes, or you can download or listen online.